One of our upper school pupils visited Spain during the October break. 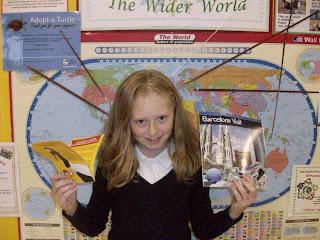 Whilst exploring the Barcelona region she took some time out to buy her class a book about the area (bilingual) to let them find out more about where she was. The local maps have also been of great interest to the pupils. Many thanks! Did you enjoy your visit to Barcelona? I´m going to travel to Barcelona this weekend. There is an exhibition of boats there and I´m very keen on sailing. I´ll take some photos to send you. Greeting to all of you from Spain. Greetings to all of you from Spain. Thank you - that would be great. My favourite place in Barcelona is Parc Guell. It's very beautiful.